The idea of taming sound by reducing decibel (dB) peaks and dips is a fairly new concept. Musicians began using foams to diffuse sound in recording studios as early as 1979, when the concept of soundproofing became publicized by the Acoustics First Corporation, then came commercial soundproofing for places like restaurants and offices to reduce noise for their customers. Now, just about anybody can create an optimizable acoustic space by means of strategically placing acoustic foam, typically made of polyether or polyester. A majority of soundproofing is performed by absorption, which is what we plan on doing in this experiment by using acoustic foam. Acoustic foam was invented and patented in 1965, but was not widely used until the late 1970’s. 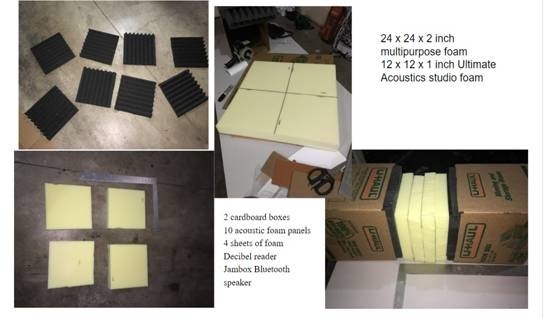 Nowadays, acoustic foam is much more commonly used, such as in movie theaters, manufacturing facilities, gymnasiums, auditoriums, recording studios, and more. 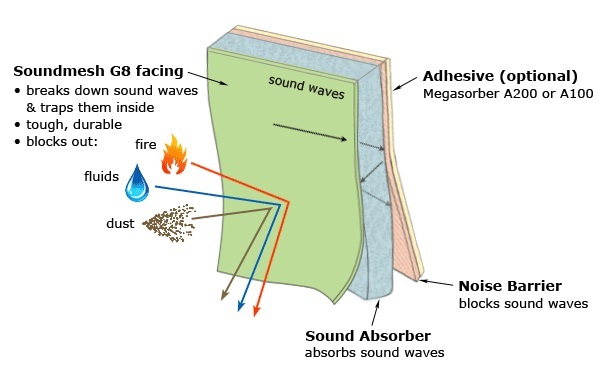 Absorption is the most common type of soundproofing, and the most effective. In this process, the sound wave is absorbed and reflected off the walls in the foam, converting the sound to a very small amount of heat. 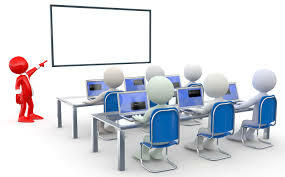 The foam we are using is known as a porous absorber, which absorbs sound by creating friction between the sound wave and the cell structure of the absorber. Porous absorbers are very efficient with medium to high frequencies, but do tend to struggle with low frequencies. 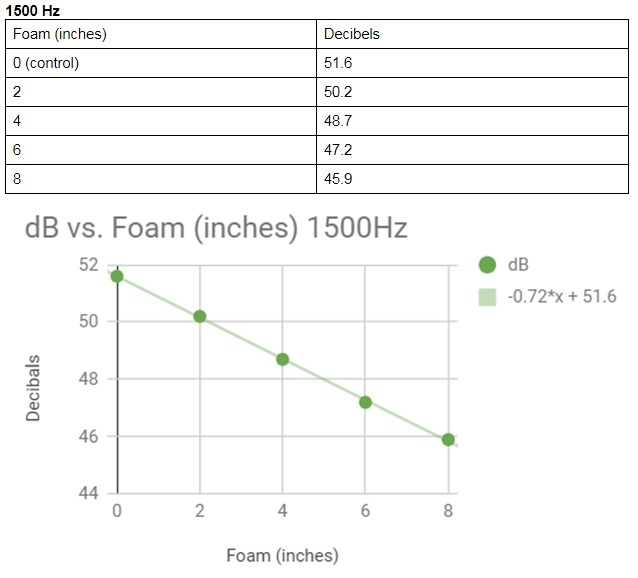 We believe that the sound waves traveling through foams with greater thickness will read less decibels, due to the amount of air pockets redirecting and diffusing the waves within the foam. 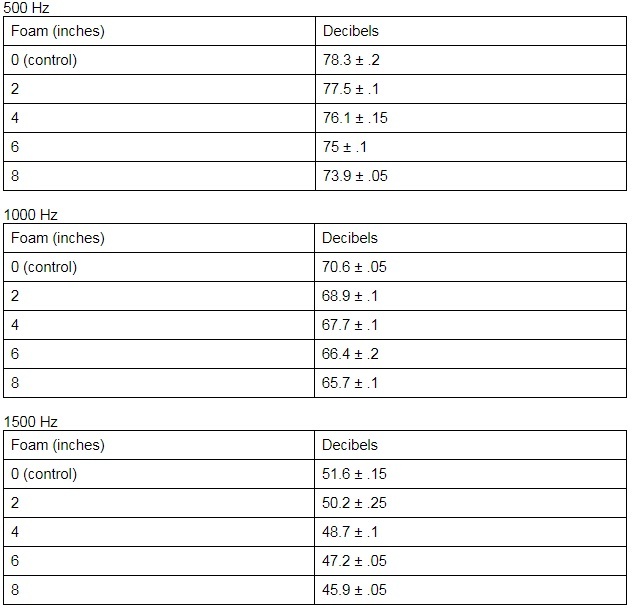 The independent variable will be the amount of foam layered, and the dependent variable will be the sound measured through the decibel reader. The purpose of this investigation is to determine to what extent material thickness influences the attenuation of sound. 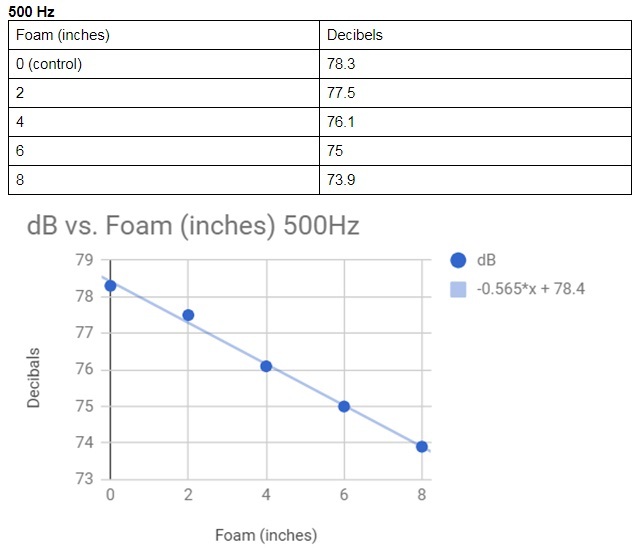 The overall question we are trying to answer is: to what extent does the thickness of foam affect the amount of sound heard on the other side of the foam wall, and how do different frequencies react to these thicknesses? We conducted the experiment in a garage with an average noise level of 44 decibels compared to most silent rooms at 30 decibels. There was minimal sound pollution in this location. The experiment was conducted three times with the different Hz levels, the data points shown are averages of three readings per foam layer, due to possible sound pollution from uncontrolled outside sources in order to eliminate uncertainties. Our independent variable was the inches of foam and our dependent variable was the amount of decibels protruded through the foam by the speaker. It is apparent that sound with a lower frequency travels a much larger distance and this is displayed by our data. It is also proven by our data that as the material, in this case foam, increases in thickness, sound heard on the other side of said material will read less decibels as the material is being layered increasingly. Furthermore, this relationship between material thickness and decibels is purely linear. It is credible that sounds of lower frequency will be less impacted by these layers of material; as shown by the 500 Hz frequency and 4.4 dB drop, while the opposing end of the data showed a 5.7 dB drop at 1500 Hz, and therefore it is proven that lower frequencies travel further distances. This can be applied to real life when we listen to music outside of an auditorium, or when you roll down your car window and here the bass of a song two or three cars ahead. The speed of a compression wave travels depends on the medium through which it is traveling. In the same medium, all sound waves travel at the same speed. For this reason, acoustically minded builders of auditoriums and concert halls avoid the use of hard, smooth materials in the construction of their inside halls. A hard material such as concrete is as dissimilar as can be to the air through which the sound travels; subsequently, most of the sound wave is reflected by the walls and little is absorbed. This porous material is more similar to air than concrete and thus it has a greater ability to absorb sound, and reflections are minimal. Foam was a great material to test in this case due to its ability to attenuate sound with minimal reflections. Within the data collected there was one major error which consistently showed to proof our hypothesis wrong. Originally, upon testing the 1500 Hz frequency with 2 inches of foam, there was an anomaly which gave us impractical data, this would have compromised our data relevance for that frequency so we re-tested multiple times, and upon receiving a reading which persisted with our data and the trend of the surrounding data points, the discrepancy was solved. It is quite possible that sound reflections could have occured in a pattern which gave us a particularly low reading each time, but the fact that this happened for 3 readings, as well as 2 extra readings due to skepticism made the error an unnecessary contribution to the data. Similar errors may have occurred because of our imperfect model, with the attempt to control where the sound was directed, we may have also indirectly changed the path of the sound waves, possibly reducing the accuracy of the readings. To replicate this experiment at its greatest potential we would have to bring a speaker and a more accurate dB reader into a soundproof chamber, this would eliminate most, if not all, of the sound pollution that could have caused slight skews within our data. •	“Absorption.” Auralex Acoustics, www.auralex.com/products/absorption/. •	Colleran, Nick. “Acoustics Then and Now.” Acoustics Then and Now | Article - Acoustics First Acoustical Panels and Soundproofing Materials to Control Sound and Eliminate Noise™, www.acousticsfirst.com/article-acoustics-then-now.htm. •	PhysicsLAB: Introduction to Sound, dev.physicslab.org/document.aspx?doctype=3&filename=wavessound_introsound.xml. •	Selik, Melissa, et al. “Signal Energy vs. Signal Power.” OpenStax CNX, Creative Commons, cnx.org/content/m10055/latest/.